KANSAS CITY, Mo. (AP) — Patrick Mahomes finished 5 of 7 for 33 yards on two drives in the Kansas City Chiefs‘ 17-10 loss to the Houston Texans in the preseason opener for both teams on Thursday night. Houston’s Deshaun Watson, who’s coming back from a torn ACL, was used sparingly. He threw only one pass — a 4-yard completion to wide receiver Bruce Ellington — during a five-play drive to midfield that featured four handoffs to running back Lamar Miller. Mahomes at No. 10 and Watson at No. 12 were taken in the first round of the 2017 draft to be franchise quarterbacks. 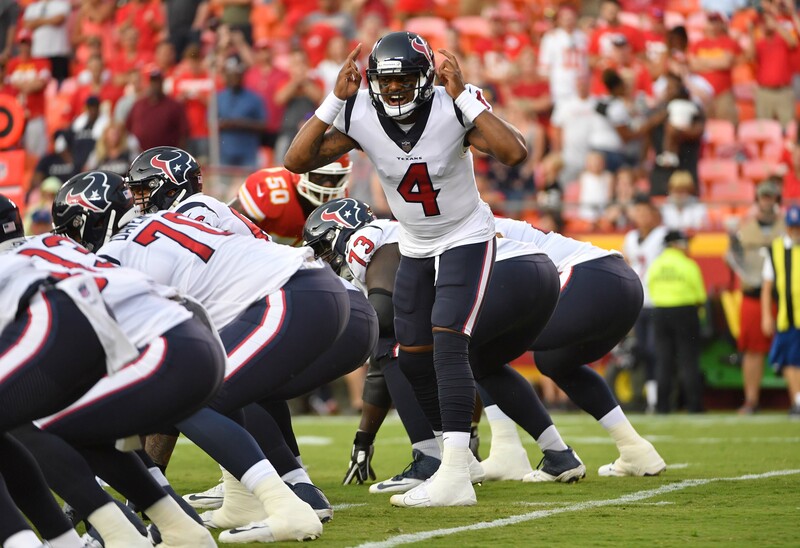 Brandon Weeden took over for Houston after the game’s opening drive and led back-to-back touchdown drives before joining Watson on the sideline for the remainder of the game. Mahomes took over the starting job when Alex Smith was traded to Washington during the offseason. He also was sacked once and didn’t throw a touchdown or interception. Mahomes didn’t complete a pass longer than 14 yards and never targeted Sammy Watkins, who signed a three-year, $48 million deal with the Chiefs in the offseason. Weeden led Houston on a 12-play 68-yard drive during his first series, which was capped by a 6-yard touchdown to rookie tight end Jordan Akins. Weeden hooked up with Akins for a 14-yard touchdown on the opening drive of the second quarter, finishing 9 of 11 for 97 yards with two touchdowns. Mahomes’ backup, Chad Henne, was responsible for the lone Chiefs touchdown — a 24-yard strike over the top to Demarcus Robinson late in the second quarter. Robinson finished with game highs of three catches and 48 yards, while Henne overcame a rough start, which included an interception on a tipped pass, to finish 8 of 14 for 91 yards with a touchdown and an interception. Several notable players were absent for both teams. Chiefs safety Eric Berry (Achilles’ heel), who was injured in last year’s regular-season opener, didn’t dress for the game. Backup Eric Murray got the start alongside rookie safety Armani Watts, who replaced injured starter Daniel Sorenson (knee). Kansas City also was without both starting inside linebackers — Anthony Hitchens, a free-agent acquisition from the Cowboys, and Reggie Ragland. Second-year pro Ukeme Eligwe and veteran Terrance Smith played with the starters. Most of the Texans’ absences also were on defense. Linebacker Whitney Mercilus (soft tissue injury) didn’t make the trip and linebacker Benardrick McKinney didn’t play. Defensive end J.J. Watt, who is returning from a broken leg suffered last October in the regular season against the Chiefs, and linebacker Jadeveon Clowney (knee) didn’t play either. Offseason addition Tyrann Mathieu and Johnathan Joseph also sat out for Houston, while starting wide receivers DeAndre Hopkins and Will Fuller took the night off as well. There were no protests at Arrowhead Stadium from players on either team — though a few Chiefs, in particular, stood well off the sideline near the benches — during the national anthem. It didn’t appear that any players went to the locker room for the anthem. Texans LB Kennan Gilchrist did not return after absorbing a helmet-to-helmet blow late in the fourth quarter from Chiefs running back Darrel Williams. The play could have been called a penalty under new NFL rules regarding players lowering their heads and leading with the crown of the helmet, but no flag was thrown. The Chiefs (0-1) return to action Friday, Aug. 17, at the Atlanta Falcons. The Texans (1-0) host the San Francisco 49ers on Saturday, Aug. 18.